A sesshin (攝心) is a period of intensive meditation (zazen) in a Zen monastery. While the daily routine in the monastery requires the monks to meditate several hours a day, during a sesshin they devote themselves almost exclusively to zazen practice. The numerous 30-50 minute long meditation periods are interleaved with short rest breaks, meals, and short periods of work (Japanese: samu) all performed with the same mindfulness; nightly sleep is kept to a minimum, 7 hours or less. 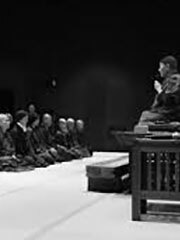 During the sesshin period, the intense meditation is occasionally interrupted by the master (roshi) giving public talks (teisho) and individual direction in private meetings (which may be called dokusan, daisan, or sanzen) with the monks. In modern Buddhist practice in Japan and the West, sesshins are often attended by lay students, and are typically 1, 3, 5, or 7 days in length. The seven day sesshin is typically held only once per year, during the winter, in commemoration of the Buddha‘s awakening to annuttara samyak sambodhi. At this Rohatsu sesshin, the practitioners typically strive to quiet the mind’s chatter to the point of either Stopping thought, samadhi, kensho, or satori. A sesshin schedule in the West will typically allow for about nine periods of zazen per day, 30-40 minutes each, with five minute periods of walking meditation (kinhin) between zazen periods. Meals are taken in a formal meditation ritual of oryoki. Work periods comprise 2-3 hours of the day, usually in gardening, cooking, or cleaning. The sesshin schedule typically allows for 6-7 hours of sleep per night, though practitioners occasionally will spend much of the next-to-last night of a 5 day or 7 day sesshin in zazen. This is called yaza and is much revered as a particularly effective time to meditate when the thinking mind and ego lack the energy to derail practice. It has been reported that at least 3 days of sesshin are usually required for the practitioner to ‘settle down’ in the sesshin routine to the point where the mind becomes quiet enough for the deeper types of meditation and samadhi to begin. Some people unfamiliar with the process have reported becoming disoriented and fearful of incurring psychological damage during sesshin. Some Zen centers do not allow novices to attend long sesshins without much prior experience and screening by the practice leaders. Sesshin can lead to deep experiences of awakening that may at times be somewhat traumatic, akin to a ‘spiritual emergency’ or kundalini symptoms. This potential for experiences of mental ‘breakdown’ is also suggested by the traditional Zen Oxherding pictures which depict a journey of struggle with a wild and unruly and powerful ‘force of nature’ that must be tamed before it becomes helpful or pleasant.